This is the text of an acount of a walk around Oxhey Village in about 1935, as narrated by Ron Fordham who was born in 1903. He tells how he arrived at his home, 47 Pinner Road on 5 June 1935, and describes the environs of Oxhey Village at this time. 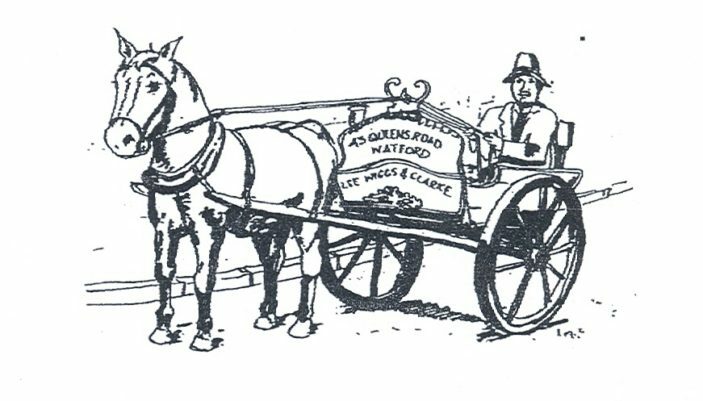 Mr Pitkin, the dairy man also lived in the road, and at that time the milk was still delivered with a horse drawn milk float, and decanted from the churn into his customers’ jugs. It is interesting to hear that back 79 years ago, the local firm of Lucketts were running a taxi service, which included a horse and carriage, used for special events such as weddings, and at that time, also kept ‘The Spotsman’ public house. While the pub is no more, the taxi business has enjoyed greater longevity. In the course of a very detailed description of the shops, tradesmen, businesses and local landmarks; one of the highlights is the description of the steam trains going through Bushey, and the local children standing by the Oxhey Road bridge to watch them taking on water. On one notable occasion one of the locomotives was the Coronation Scot Express. See the attached scan for the full text. Reading Ron Fordhams, ‘A walk Round Oxhey Village’ made very interesting reading. I have been searching for a considerable time for the name of the Dairy that I passed in Pinner Road, with my Brother Jim when we went shopping at the Co-op. It was ‘Pitkin Dairies’, mentioned by Ron, also the Doctors Surgery on Chalk Hill, this was where our Doctor, Dr Leeslow shared the same ‘Practice’ as Dr Aveling. Dr Leeslow lived in a large beautiful house, in Nancy Downs, now demolished, and replaced by a small housing estate. At 82 I find these articles very interesting as they stimulate the brain, and vitalise my memory. A big thank you to all your contributors for these articles, a pleasure to read.